If you’re looking for self esteem activities for kids, you’ve come to the right place. With a new school year underway, I’ve been thinking a lot about how to build my daughter’s self-confidence over the last couple of weeks. I’ve always struggled to feel comfortable in my own skin, and while my child doesn’t seem to be plagued with the need to fit in like I did when I was growing up, I know all-too-well how cruel kids can be, and how easy it is to squash a young child’s self-esteem. Like most moms I know, I’ve read heaps of posts and articles detailing all the different ways parents can help build their kids up. I remind my daughter that none of us are perfect, I spend a lot of distraction-free one-on-one time with her, I’m careful to assign age-appropriate chores so she feels like a contributing member of our family, I allow her to make her own decisions so she can learn about consequences, and I’m forever telling her how much I love her, but somehow, it never feels like it’s enough. I’m not convinced she understands how utterly amazing, valuable, and important she is, and I worry that another child will say or do something that will permanently damage her feelings of self-respect and self-worth. So I’ve been poking around the internet looking for some meaningful self esteem activities for kids, and I’ve been delighted at all of the amazing ideas I’ve stumbled upon. I found a great book called Have You Filled a Bucket Today? that I think every kindergarten and lower elementary classroom should read together at the beginning of the school year, and relived my childhood while watching my favorite Sesame Street characters perform with will.i.am. I also found some amazing self esteem activities for kids that make the perfect classroom or after school activity. Here are 11 of my favorites! I like to think we’re raising our children in a day and age where differences are tolerated more than they were when you and I were kids, but in the face of higher instances of developmental challenges like autism and sensory processing disorder, I’m sad to say that couldn’t be farther from the truth. It is up to us as parents to build our kids up, and I hope this collection of self esteem activities for kids will inspire you to do exactly that. 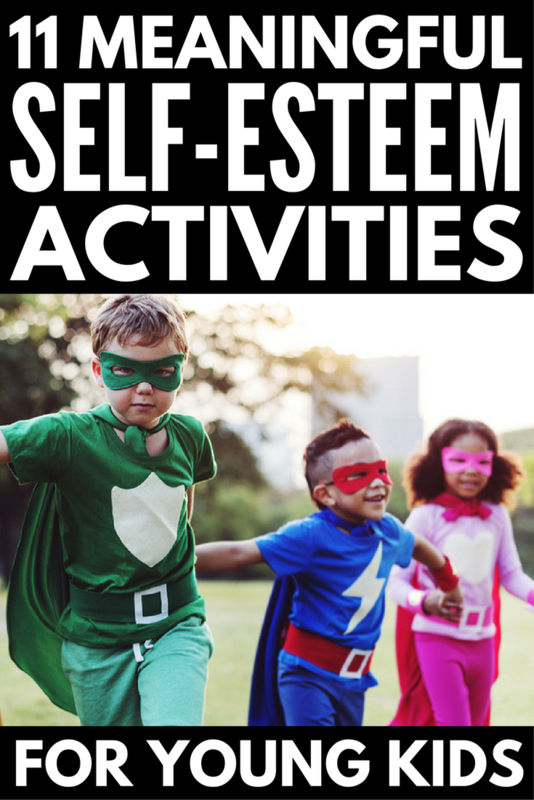 If you liked this collection of self esteem activities for kids, please share this post on Pinterest!